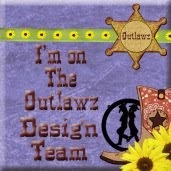 This is a fun hop with the Gina K & MISTI Design Teams. #2 Stitched Leaves mini kit from Gina K.
The deadline for commenting is September 5th at Noon Central. Winners will be posted on the My Sweet Petunia blog winners page and on the Gina K. Blog no later than Friday, September 8th. If you came from Ilina Crouse you are in the right place! 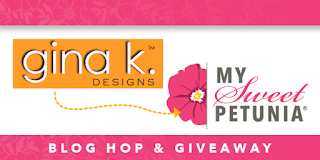 I am thrilled to be participating in this fun hop with so many talented designers! I made a few cards and a video. 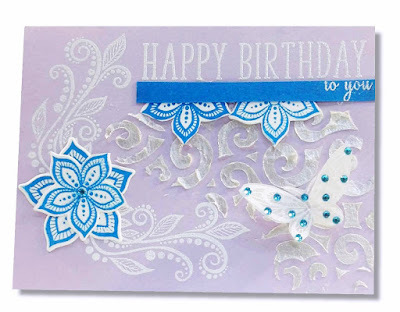 In the video I show how I made this lavender card and the design process for all three.If you are new to my videos, I show how to craft with diminished strength and hand issues. I use and try a lot of products and tools. The MISTI was a game changer for me! These are the cards I made. 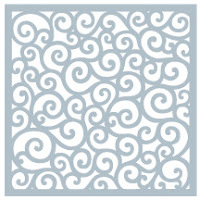 Be sure to check out the great selection of top quality Gina K cardstock and matching inks. 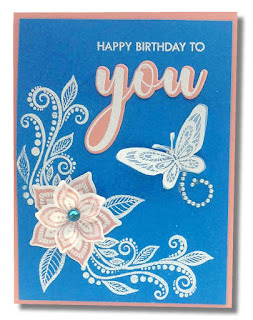 I used the Gina K Designs Boho Flowers Mini Kit, Grand Greetings, Pure Luxury cardstock and Rounded Swirl stencil. I stamped with both the Original MISTI Laser Etched & the Mini MISTI Laser Etched. What a great set of birthday card designs. 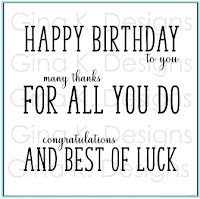 Such great cards - thank you for sharing! Very pretty --love the color combos. Thanks for sharing and inspiring us. The designs are lovely; the gorgeous blues bring them to a whole other level! Nice cards! I love that you used softer colors. Those Boho flowers are very cute! Very nice! thank you for sharing how the Misti makes crafting easier for you. This is a fun hop-I love seeing the different ways people use their Mistis! I like your idea of going with s color as a theme. Beautiful shades of blue and white! Very pretty! I like the creativity of each blogger ... same elements, but different and beautiful results! Very pretty Card. 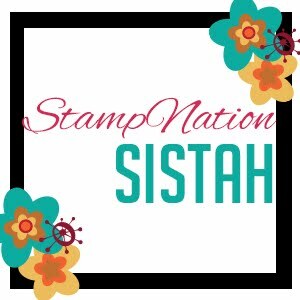 Love this stamp kit! 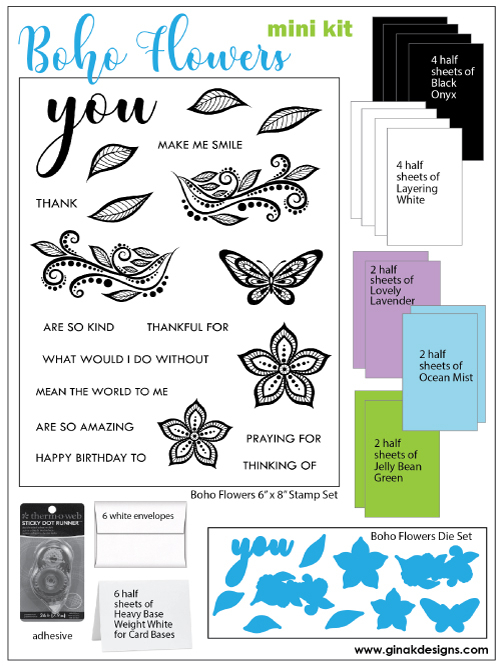 So neat to see your approach to using this great stamp kit. I think my favourite might be the 2nd one. TFS! I like your elegant cards. Great cards. I know how you feel about strength. I am so glad I have the original MISTI. I can just stamp and re stamp. Pretty card! Love the added texture! Beautiful color palette on these! Lovely set of cards! I love the Turquoise Gems not the white Butterfly. Pretty cards! I will watch the video later, when I have more time. Thanks for sharing. Elegant birthday cards. Thanks for sharing. Lovely cards - love the blue! So pretty Joyce! Love your cards and all the products you used go so perfectly together! Beautiful card, love the white one. Beautiful and elegant cards - thanks for sharing the awesome video. What fun cards. I love how different they are from what I've seen before, with this kit. Particularly like the blue cards! Thanks for sharing your creativity! Beautiful cards! Love the pearlescent embossing paste. You are a true artist. Love the white on blue, a truly elegant bithday card. Love the idea of stacking the two flowers. Love the blue background with the purple accent color. Very pretty! They are all so pretty! The blue and purple is my favorite! Beautiful composition and color schemes. Your colors are so pretty. Your cards are so lovely. I am so happy I stopped by to see you today. Great cards. Thanks for doing the video. Beautiful cards! Love your color selection! Thanks for sharing with all of us! Very pretty cards. Like your compositions and color choices. Nice! 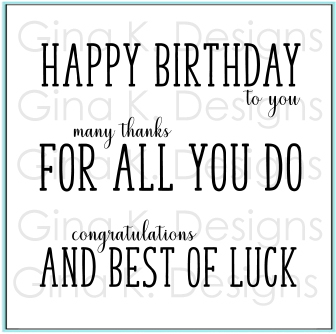 Thank you for sharing 3 such lovely cards...each with its own vibe! Very nice cards! Great colors. Love the Boho Flowers! Beautiful set Joyce. Love the colours. I love how you stamped the you image onto colored yardstick. Great cards! You did a fabulous job with this beautiful kit, thanks for the inspiration! Lovely cards. It was nice seeing how the Misti helps you. My friend has hand issues too and after trying my Mini Misti she bought it from me and I bought the regular size. Beautiful cards and I love the Boho flower kit a lot. Cute cards. My favorites are flowers and butterflies and you have both!!! Love the look. Those flowers are great. Very nice set of cards. Beautiful cards! Love this kit! It's fun to play with color! Thank you for sharing. Fabulous cards! Love your colors and those fantastic flowers! Lovely cards. The turquoise color is wonderful. Beautiful cards, Thanks for the video! I love my Misti! Such pretty cards! Thank you for the video, as well!!! liked the video. great idea to make pieces from the stamps and dies to use for arranging. Nice color scheme and layout of the cards. Great colors, I would never have thought to use these colors together! Just started following you everywhere. I love your color choices! Great cards too! Love this design. Can't wait to get home and try. What fun designs. 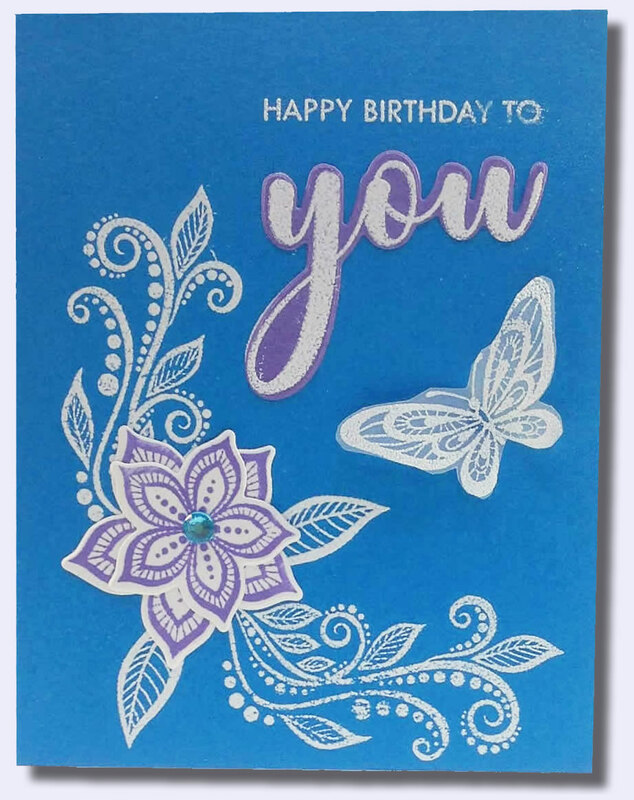 Did you use rhinestones for the little air swish behind the butterfly on the first card? If you mean the lavender horizontal card, it's texture paste and stencil:-) I show in the video. Gorgeous color combinations! Thanks for sharing! The idea of die cutting the word "You" then stamping it in white is wonderful. Wonderful video, Joyce! I really like your creations. Love the added stencil work! love your cards!!! Love how just changing the colors can give such a different look and the addition of the stencil on the one is beautiful!!! I love the colors you used on your cards! So pretty! 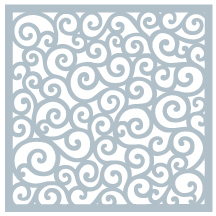 Thanks so much for the video using the MISTI--that was new to me, and showing your design of GinaK's Boho. I agree how marvelous the weight and colors of GinaK's paper is. Very pretty cards. Thank you for sharing. TFS your pretty cards and great video! Love the effect of white embossing with these stamps. Beautiful! Love the blue - my favorite color. The die cutting is great. Oh, wow! On the first card, it almost appears as if the leaves are embroidered! Really cool effect! Thanks for the video and instructions. Beautiful card. I'm loving the look of those white on blue Boho flowers!! 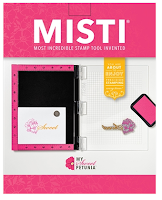 I am so glad the MISTI came along to make stamping easier for you. You are an inspiration! I really like the blue and peach combo. That blue is so vibrant and pretty. Great inspiration. The blue card just pops right out of the screen. Lovely.